Clerk of the Circuit Court Jacqueline Smith, right, administers the oath of office to Victor Angry, as Ernestine Jenkins assists. 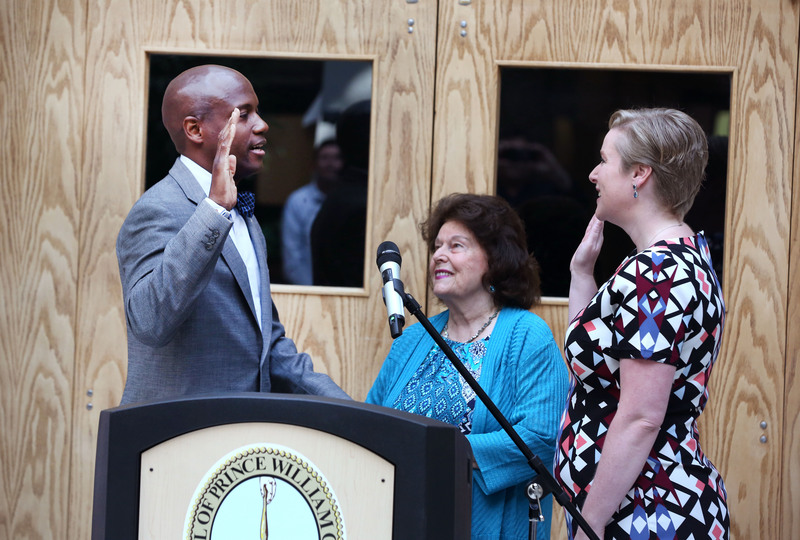 Prince William County’s newest supervisor, Victor S. Angry, was sworn in this morning. He is filling the vacant Neabsco District seat on the Prince William Board of County Supervisors. Angry takes over the seat left vacant at the death of John D. Jenkins, who served on the board for 36 years before his death in February. Jacqueline Smith, Clerk of the Circuit Court, welcomed everyone to the ceremony at its beginning and called the event a “momentous occasion.” “We’ll be swearing in Victor Angry – the first ever African American member of the board of county supervisors.” The ceremony was held in the atrium of the McCoart Government Center. Angry told supporters at the ceremony that he was thankful to have been elected and that he couldn’t have done it without the help of those in the district. “I did not do this alone. There are so many people, actually in this room, who made this happen, who wanted it to happen, and I can’t thank you enough,” said Angry, a retired U.S. National Guard Command Sergeant Major. Angry will complete the remainder of Jenkins’s term, which runs through the end of this year. The Neabsco District Supervisor Office will continue to be located at 4361 Ridgewood Center and may be reached at 703-792-4667 for constituent services. Next Article PWCS is a Breakfast Challenge Gold Winner!